Northern Tablelands MP Adam Marshall pictured on the steps of State Parliament yesterday with Bundarra Central School Principal Jennifer Cox, left and student leaders Bianca Nelson and Tory Vickery. STUDENT leaders from Bundarra Central School got a taste for NSW politics yesterday in Sydney, during a tour of the oldest Parliament in Australia. 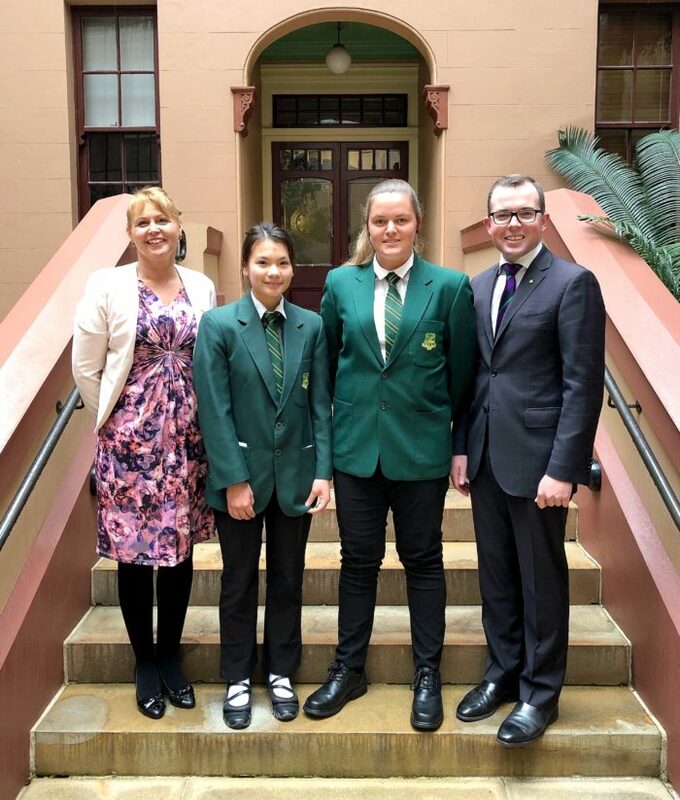 School leaders Bianca Nelson and Tory Vickery were hosted by Northern Tablelands MP Adam Marshall during a Secondary Student Leadership Program, conducted by the NSW Parliamentary Education Branch, which included a visit to Government House. “Bianca and Tory were exceptional ambassadors for their schools and the Bundarra community. Later in the day, the leaders were hosted by NSW Governor David Hurley at a reception at Government House. “All the student leaders were able to learn more about the day-to-day operations of the Parliament, including the machinations of the ‘Bear Pit’, and were introduced to some of the constitutional foundations of our State,” Mr Marshall said. “School leadership is where many national, state and local government representatives are inspired to pursue their careers in community service. “Being a school leader is an incredible privilege as they are elected by their entire student body and I hope some of students from yesterday continue with their leadership ambitions into the future.